Wait! Don’t be so quick to throw away that broken or outdated picture frame. Like plenty of other multi-functional decor items, frames come with endless DIY opportunities. Sure, the glass may be shattered -- a result of either your dog or child, we take it -- but there are inexpensive (and efficient) ways to repurpose that base. Make yourself a stylish chalkboard to hang inside your home, or outside your front door as a welcome sign . The first step is finding a piece of hardboard to fit the dimensions of the frame, and that shouldn't be too difficult. Then, you cover that hardboard evenly with chalkboard paint. Note: You may need a few coats for adequate and even coverage. 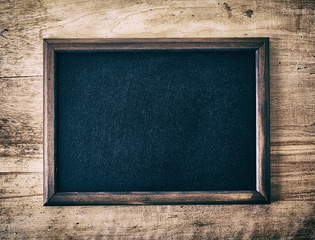 Homemade chalkboards are pretty simple to pull off, and are guaranteed to be one-of-a-kind. This is similar to the homemade chalkboard mentioned above, except even easier. Simply find a cork board with dimensions that fit your frame. Using push pins, you can hang photos, greeting cards and even little reminder notes. So much fun! 3. Get in the holiday spirit by making a picture frame wreath. Think outside the box and pull off a Christmas wreath with a twist. Pull in some holiday-inspired accessories – like ferns, pinecones and ornaments – and attach them onto the frame in whatever way you see fit. Either round or square frames could work for this idea. Get creative. If you’re a little flashier and have a gold- or silver-accented frame, give your makeshift wreath an edge, with glittered or metallic accessories . To pull this off, simply run wires across the frame in however many rows you think you'll need. Staple the wire in place, and voila! Your very own, DIY earring holder ! You could always be more creative, of course, using other materials (like lace trim, for example) instead of wire. There are plenty of ways to recycle old frames. So remember – when you make a decision to toss that busted frame, you’re giving away the perfect opportunity for a simple, fun DIY project.